Tearing scrapbooking papers is often a forgotten technique, especially if you are a fan of layouts with straight clean lines like me. However, when used discreetly, as in the layout below, it is a great way to add interest to your page without making it messy. 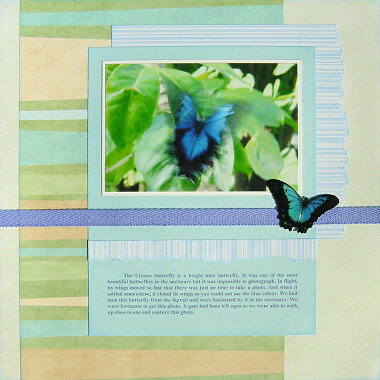 This layout was created using Creative Imaginations Vine Stripe paper, Autumn Leaves Stripes paper, Doodlebug Blue Stripe paper, blue cardstock, white cardstock, blue ink, blue twill and Frances Meyer Butterflies stickers. 1. Use the Creative Imaginations Vine Stripe paper for your background. Ink the edges with blue ink and set aside to dry. 2. Cut a strip of Autumn Leaves Stripes paper approximately 21cm wide and ink the edges with blue ink. Adhere it vertically to your background approximately 1.5cm from the left edge. 3. Cut a piece of Doodlebug Blue Stripe paper approximately 19cm wide by 17cm tall. Make sure the stripes are horizontal. Tear down the right edge, as shown in the layout above. Ink the edges with blue ink. Adhere to your background approximately 2cm from the top and 9cm from the left edge. 4. Cut a piece of blue cardstock measuring approximately 18cm by 23cm. Ink the edges with blue ink and add your journaling to the bottom section, as shown in the layout above. Adhere to your page approximately 4cm from the top and 7cm from the left edge. 5. 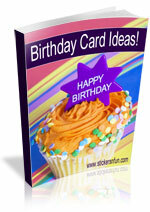 Mat your photo with white cardstock. Adhere towards the top of your blue cardstock, as shown in the layout above. 6. Cut a strip of Doodlebug Blue Stripe paper approximately 18cm wide by 2cm tall. Make sure the stripes are vertical this time. Tear along the bottom edge. Ink the edges with blue ink and adhere to your blue cardstock, just above your journaling. For the best effect, the top edge of this strip should follow the same line as the bottom edge of your larger piece of Doodlebug Blue Stripe paper. 7. Adhere a piece of blue twill across your page underneath your photo and above your journaling. 8. Finish off by placing a blue butterfly sticker from Frances Meyer Butterflies stickers on top of the twill near the bottom right corner of your photo. You may like to adhere it to cardstock and cut it out first to give it depth. This entry was posted on Sunday, April 6th, 2008 at 5:34 pm	and is filed under Butterfly, Paper Tearing. You can follow any responses to this entry through the RSS 2.0 feed. You can leave a response, or trackback from your own site. Thanks Jessica…I’m glad you like it. If you do use it, I’d love to see your spin on it.